Solidarity with Georgia’s Undocumented Students and Freedom University: Lift the Ban on Undocumented Students at Georgia’s Colleges and Universities! 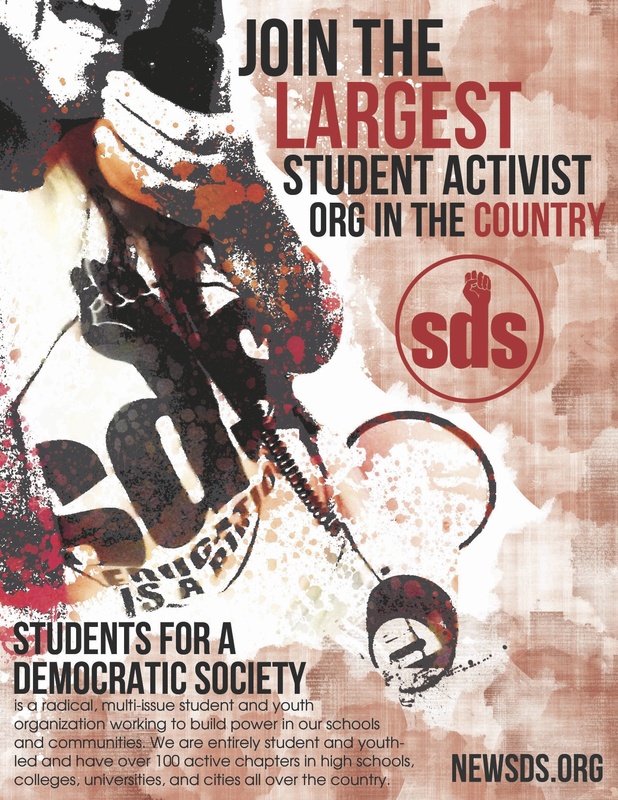 Students for a Democratic Society (SDS), a progressive student activist organization at the University of Minnesota, stands in solidarity with the students sitting-in at the University of Georgia campus for immigrant rights. Undocumented students from across the state gathered in Athens, GA, on April 28th to demand the Board of Regents decision to ban undocumented students from Georgia’s top colleges and universities be overturned. UMN SDS stands with Freedom University, the organization that coordinated the protest and has consistently resisted the Board of Regents ban since 2011. On the 28th, students rallied at the UGA arch, at the edge of campus, marched to the administration building, and sat-in at the entrance to the building. UMN SDS supports these students and demands that University of Georgia president, Jere Morehead, and the Georgia Board of Regents make immediate steps to rescind the ban on undocumented students. We believe that public universities need to serve the public and be accessible to all residents, documented or not, from Georgia to Minnesota. This year SDS chapters in Florida have organized to push for tuition equity for undocumented students, which targets tuition as a major economic barrier to higher education access for immigrant communities. In Georgia, legal barriers to higher education access are still in place, echoing the U.S. South’s historic regime of Jim Crow segregation and White Supremacy which was the law of the land just a few decades ago. These exclusionary laws and B.O.R. dictates need to end! UMN SDS gives our full support for struggles in the South, in both Florida and Georgia, to overturn all barriers to undocumented students’access to higher education. Lift the Ban on Undocumented Students! Every victim of a crime deserves our sympathy and has the right to feel safe at the University of Minnesota. But we feel that recent steps taken to enhance campus safety are more an over-reaction to fears generated by reports of University officials than due to a real threat of increasing crime. We believe our campus is fairly safe and that the reaction to the increased reporting can create more dangers than it solves. However, from time to time, truly dangerous people do come to our campus. We would like to alert you to the upcoming presence of such a person on the University of Minnesota Twin Cities Campus. On April 17, 2014, Dr. Condoleezza Rice will be present at Northrop Auditorium at 5:00 p.m. and for some time thereafter. There is probable cause to believe Dr. Rice has been involved in massive criminal activity. A summary of the evidence, with links and multiple references to further documentation, can be found at this website: http://www.stanford.edu/group/antiwar/cgi-bin/mediawiki/index.php?title=Condi_coalition_letter_draft. We have also attached the document to this email. But in terms of bureaucratic warfare, he was no match for David Addington, the vice President’s legal counsel. Addington, with the full support of the Vice President, had a view — an expansive view — of presidential prerogatives during wartime and, drawing on opinions by lawyers such as Jay Bybee and John Yoo in the Justice Department’s Office of Legal Counsel, was determined to push the boundaries of executive authority…That means that the State Department, the military, and even the attorney general were outflanked on occasion. 18 U.S.C. Sec. 2340A(c), which criminalizes a conspiracy to torture, which underlying offense is codified in Sec. 2340A(a) and defined in 18 U.S.C. Sec. 2340. 18 U.S.C. Sec. 2441 — War Crimes, in particular the violations codified in Section 2441(d)(1), which concerns acts prohibited by Common Article 3 of the Geneva Conventions. Some of these alleged offenses have resulted in the deaths of the victims of Dr. Rice’s conduct, so there should be no Statute of Limitations problems with respect to those cases. That is, for these types of crimes, any court in the world may charge and try an alleged perpetrator located within its jurisdiction. Dr. Rice is a 59-year-old African American woman, 5’8″ tall, and will be present on Northrop Auditorium’s main stage at the aforementioned time. If you need a picture of her, one will be provided, but it might just be easier for you to access one online. We are copying the University’s Office of the General Counsel on this email, who may be able to elaborate on how serious these allegations are. We are confident that you will at least bring Dr. Rice in to be questioned. We hope, however, that you do not employ the interrogation techniques she so willingly approved. If you need any further clarification or assistance, please do not hesitate to ask. Thank you very much for helping to make our campus safer for all of us. SDS in partnership with endorsing organizations will be showing the documentary “American Faust: from Condi to Neo-Condi” and hosting a conversation with Rice biographer Antonia Felix, who wrote the first biography about Condoleezza Rice. Join us to understand the enraging history of Rice’s role within the Bush administration as a war-time secretary of state and learn more about the reasons she should be protested.